Can Dragó is more than a park, it an enormous boulevard with green spaces, places to play, sports facilities, swimming pools and walking areas. 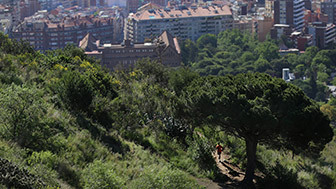 Halfway between Avinguda Meridiana and Sant Andreu, and spread over 12 hectares, Can Dragó is the green lung of the Porta neighbourhood and one of the biggest parks in the district. Designed by Enric Penyes, Can Dragó is an area of transition, halfway between Avinguda Meridiana and the Sant Andreu Cemetery. Covering nearly 12 hectares,it is a vast expanse of land that incorporates various sports facilities, such as the largest covered swimming pools in the city, an athletics track, a multipurpose sports centre, a golf course and lots of recreation and amusement areas for its visitors. It was opened in the 1990s and is named after a 17th-century farmhouse called Can Dragó that was demolished in 1973.It has been gradually expanding ever since it opened to become the multipurpose recreation park it is today. One of its more notable artistic attractions, standing on a grassy promontory in the middle of the park, is the replica of a sculpture designed by Pablo Gargallo,namely the Olympic Aurigas (charioteers). Walking or cycling among the acacias,poplars and plane trees can be a real luxury, a short escape from the enormous tower blocks you find in Nou Barris. 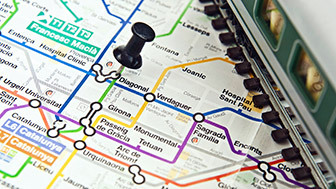 The city has an extensive public transport network connecting its districts. 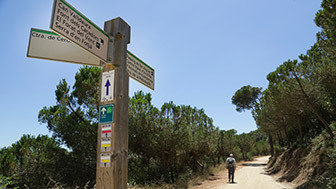 Collserola can be walked from end to end along the magnificent Passeig de les Aigües. Barcelona would not be Barcelona without its Mediterranean nature.